NYRA scheduled the best horses to race Wednesday in the fifth race instead of the ninth or the tenth. If by next summer the $100,000 Troy isn’t a graded stakes, there is something amiss with the way the American Graded Stakes Committee reads a Daily Racing Form. Arguably, three of the sport’s most accomplished turf sprinters ran in the 5 1/2 furlong Troy, including Regally Ready, the defending Breeders’ Cup Turf Sprint (gr. IIT) champion. Bridgetown, last year’s Troy winner and a winner of six stakes now, won by a half-length over another multiple stakes winner, Perfect Officer. John R. Velazquez rode Bridgetown. Trainer Todd Pletcher took the trophy from the hands of Mayor Lou Rosamilia of Troy, N.Y., after usher Dave Smith surrendered it from custody. Perhaps nobody has thought to ask Agnes Peace where the plaque for the Builder’s Kitchens, Inc. and Empire State Stone purse will go in her trophy room. Peace’s slightly-favored Boots Ahead won the sixth race, a $35,000 claiming event around two turns on the inner turf course. There was much ado about Boots Ahead wearing aluminum pads and four leg bandages. But whatever he wore obviously helped him. The Dunkin’ Donuts─America Runs on Dunkin’ race went to Eden is Burning; the Miller Lite Taste of Saratoga race to Parent’s Honor. Earlier in the day, Billboard Hit took the Doherty Applebee’s Neighborhood Bar and Grill and Wild Target won The Paul Bradicich Legacy. These five races represented $285,000 in purses. Question their names but not their worth. The same people who give of their time and their money to help others were at it again in the evening. Velazquez, Edgar Prado, Javier Castellano, Rajiv Maragh and Maylan Studart tended bar at the Saratoga National Golf Club to raise money for the Permanently Disabled Jockeys Fund and Thoroughbred Retirement Foundation. About 220 donors attended the event, although a congressman who’s not one of horse racing’s friends had a fundraiser that was three times that big at the same time in the same place. Fancy cars owned by people of means were parked on both sides of the driveway the length of the first fairway, which measures 416 yards long from the back tees. 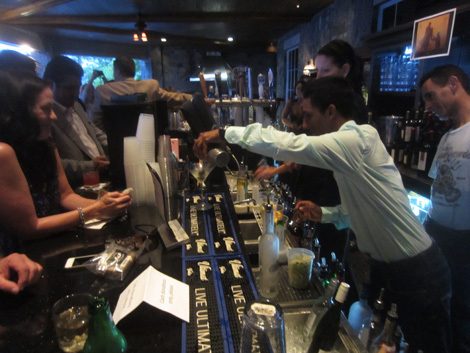 Jockey Rajiv Maragh pours a martini at fancy fundraiser. In contrast, John Hendrickson─a man who contributes more to the happiness of plain folks than any politician─grilled chicken patties for 300 backstretch workers. Hendrickson’s guests walked or pedaled bikes to a tent near the barns for their supper. Wednesday evening is Bingo Night. Race caller Tom Durkin often pulls the letters and numbers out of the spinning tumbler to get the fun going. Hendrickson rarely misses the chance to work. New York Racing Association officials were MIA at another public forum in which they used to participate. 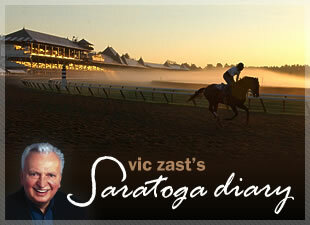 About 200 industry leaders took part in the Saratoga Institute on Racing and Gaming Law conference where the precarious status of VLT revenues was discussed. 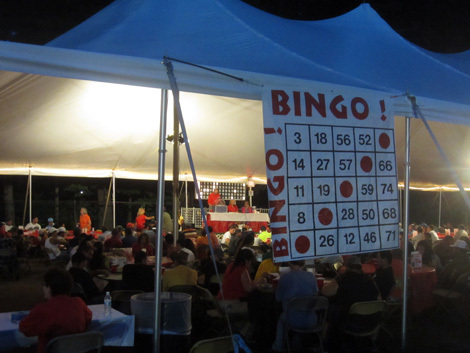 Bingo Night tent on the backstretch is play to go for 300 people each Wednesday evening.